Climate change could leave a bitter taste in the mouths of coffee aficionados, an Australian report suggested Monday, predicting it would cut farmable coffee land in half by 2050, driving prices up and quality down. The livelihoods of more than 120 million people, including some of the world's poorest, involved in the coffee industry could be affected, the Sydney-based Climate Institute said on the release of its report A Brewing Storm. 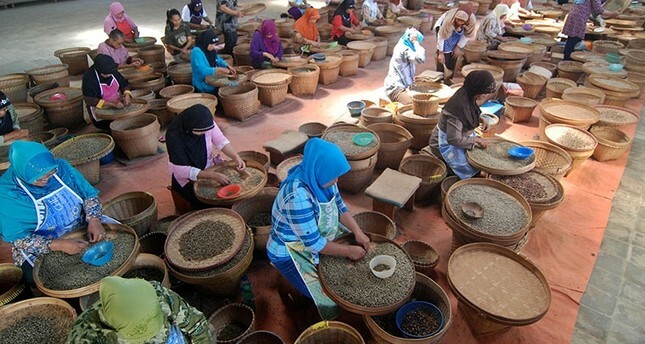 "Increasing temperatures and extreme weather events will cut the area suitable for production by up to 50 per cent, erode coffee quality and increase coffee prices for consumers," the research organization said. "Consumers are likely to face supply shortages, impacts on flavour and aromas, and rising prices," John Connor, the institute's chief executive, said in a statement. Rises in temperatures and changes in weather patterns, including rainfall, have already affected farming in many parts of key coffee growing countries like Mexico, Guatemala and Nicaragua. The changes have increased the incidence of disease and pests, affecting yields and quality, the institute said. Coffee is a global 19-billion-dollar industry. More than 2.25 billion cups of coffee are consumed around the world every day and coffee production has more than trebled since the 1960s. However 80 to 90 per cent of the world's 25 million coffee farmers are smallholders who are most exposed to climate change, the institute said. "They generally live and work in the 'bean belt' which comprises around 70 mostly developing countries, including Guatemala, Brazil, Vietnam, Colombia, Ethiopia and Indonesia," it said. "Climate change threatens their world." Without significant action to combat climate change, farmers will have to push production to higher ground to land reserved for other uses such as nature conservation and forestry, Connor said. "By 2080 wild coffee, an important genetic resource for farmers, could be extinct," he said.